Strawberries are here! Strawberries are here! Strawberry desserts are all good and fine, but I also like to use them in savory dishes, like this super healthy quinoa salad. Quinoa is an excellent grain to use for a quick meal — it only takes about 20 minutes to cook and it's high in protein. I love the way the salty feta and crunchy almonds play off the sweet berries. The basil gives it a fresh herbal kick. Enjoy. Cook the quinoa by placing it into a pot with 2 cups of water. Bring to a boil, reduce heat to low, cover and cook until the water is absorbed, about 15 minutes. Allow to cool slightly. In a small bowl, make a vinaigrette by combining the sherry vinegar, mustard and salt. Slowly whisk in the olive oil. 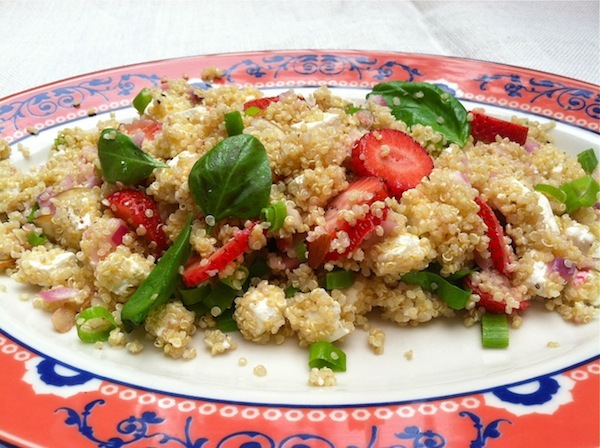 In a large bowl, toss the quinoa, strawberries, feta and scallions. Add enough vinaigrette to lightly coat the salad and toss to combine. Sprinkle the basil leaves and almonds on top. Serve at room temperature or cold. I made this a couple of times last year and it was great. One suggestion: if you aren't going to eat it all right away, hold off on adding the strawberries. I brought some to work the next day for lunch and they had nearly disintegrated (though it was still delicious). Great tip! Strawberries can get mushy. Glad you made it last year!